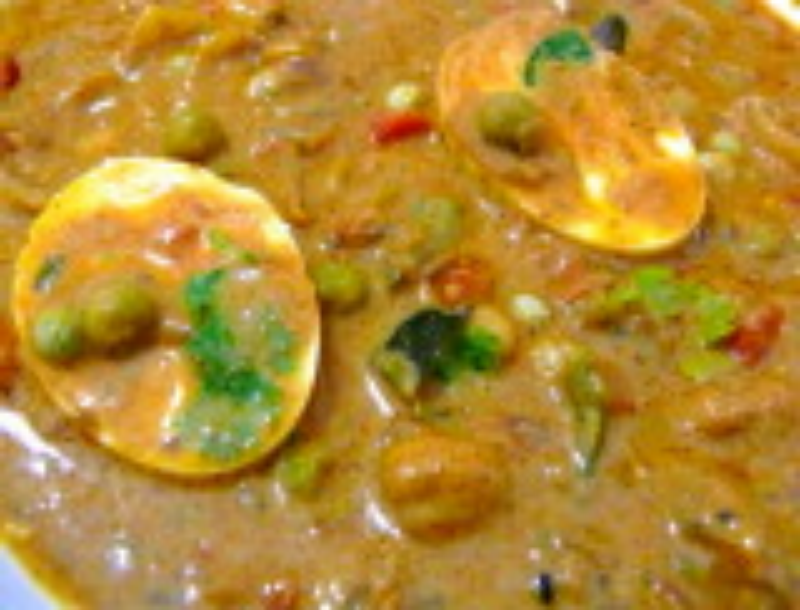 Simply superb combination of Egg and Green peas cooked with spices.This one demands 20 mins cooking time. Boil the eggs and green-peas separately for 7 mins.Keep aside. Heat oil in a Pan and fry brinji leaves,mustard seeds, fennel seeds, chopped onions, chopped tomatoes and curry leaves . Add chilli powder,dhania powder,jeera powder, turmeric powder,ginger-garlic paste and needed salt one by one in order and saute well. Add grated coconut paste and cook for 5 mins or till oil separates from the gravy. Add green peas,egg slices and and pour 2 cups of water and close the lid of the pan. Cook it for 5 minutes. Then remove the pan from the flame and keep it aside. Add chopped coriander leaves and lemon juice and cook for 2 minutes. Hi Jean, brinji leaves are bay leaves I guess. Looks good, but what is brinji leaves please? Is there a substitute. Thanks.